The Office has a diverse range of key stakeholders with different interests, needs and levels of influence. 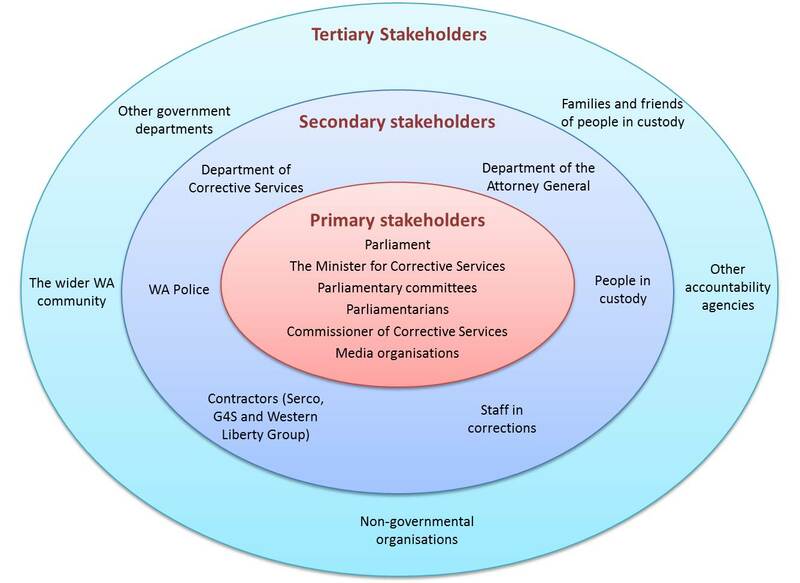 This includes groups directly influenced by its services, people involved in the WA correctional system, and those with a wider interest in social justice, human rights and corrections. A process has been developed to inform and consult with the community in relation to the Office’s work and findings. Meetings are regularly held with a constituted Community Reference Group composed of representatives from a variety of groups who provide community perspectives on matters relevant to adult and juvenile custodial services in this state. The current membership includes Aboriginal Legal Service, Outcare, Ruah, Social Responsibilities Commission, Youth Legal Services, the Prison Reform Group and Statewide Indigenous Mental Health. The group brings knowledge and expertise to the function of the Inspectorate, discusses policy matters and shares ideas relevant to this Office’s development and future direction. The inspection of the state’s juvenile and adult custodial facilities includes a process whereby community members are invited to provide feedback as well as agencies identified by the facility as ‘service providers’. The consultation process explores their experience of the facility, the custodial and non-custodial staff and the persons in the custody. This input can impact on themes to be explored during the inspection.